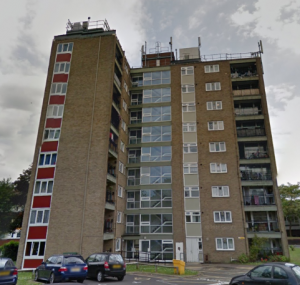 In July Carter and Faraday started a new contract for a local Housing Association working within the Leatherhead and Reigate area. This new contract includes bin cleaning, communal area cleaning and window cleaning, these services are our ‘bread and butter’, we don’t usually occur many problems with these services. However as part of the new contract we were required to clean the communal windows on a nine storey building. Most of our window cleaning contracts are a maximum of six floors and even six floors is not regular. The poles that our operatives carry on the vans are normally 40ft poles, we estimate this building to be nearly eighty feet tall. So we had the tricky task of quoting to clean these windows safely but keeping our price competitive. 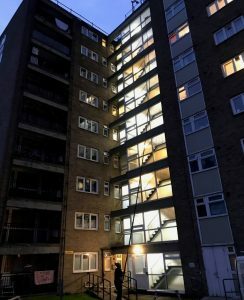 We had three options, powered access, abseiling window cleaners or an 80ft pole. We went for the 80ft pole, probably not the most exciting of the three options however we felt it was best suited for us and our customer. Yesterday we carried out the cleaning of the windows on this building with our new 80ft pole and it went very well. The supervisor for the area attended with the operative first thing as the pole is complicated and difficult to get fully extended. 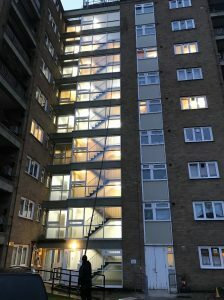 Below are some photos of the guys’ onsite, if you have some high windows that need cleaning please let us know, we’d love to give our pole another run soon.